Sleeping in the great outdoors always improves my mood, so a month before my 40th birthday I decided that I would make an effort to sleep outdoors at least once a month. The original plan was to keep it up for a year, but I am now well on my way to three years. In November I reached 33 months straight, and my enthusiasm shows no sign of wavering. April was a big month, leaving corporate employment after 12 years with the same company. 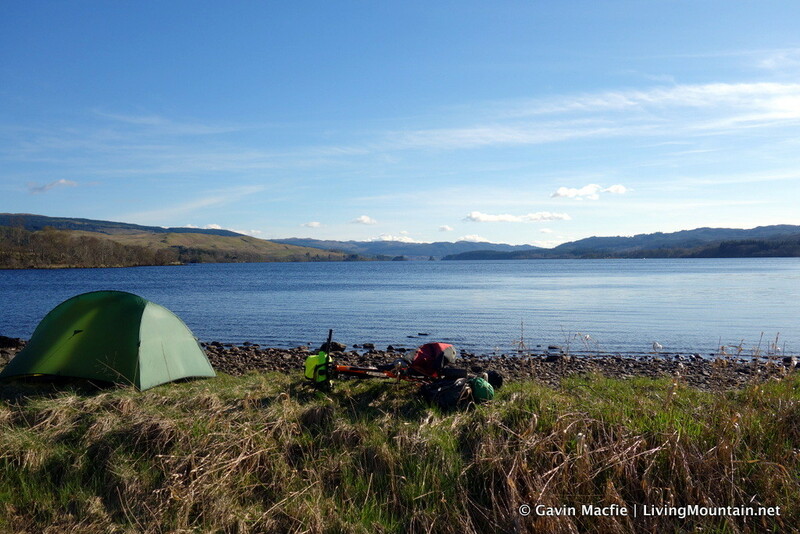 I marked the occasion by cycling around 200 miles from Knapdale to Inverness, bagging my outdoor sleeps as I went. My favourite was camp spot was definitely Kames Bay on the shores of Loch Awe. Years ago (perhaps 8 or 10?) I passed by the west end of Lochan na Hearba on a mountain bike trip with my friend Pete. 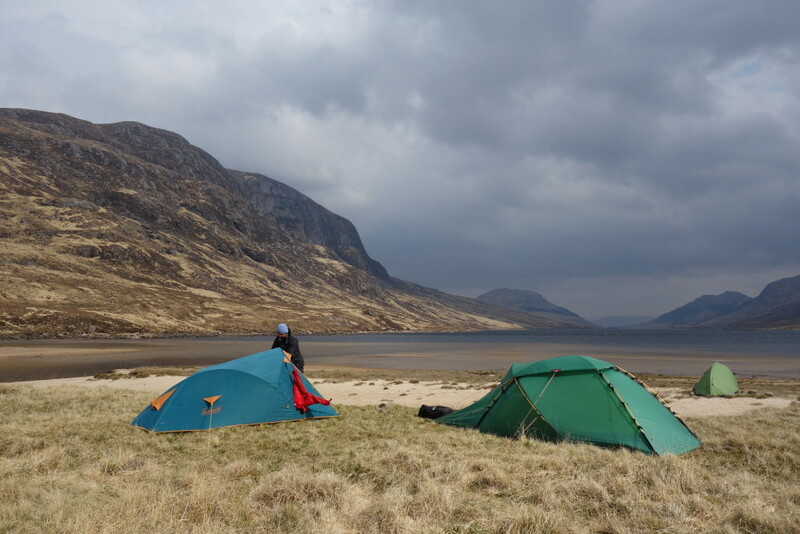 We vowed to return for two reasons, to climb Ardverikie Wall, the classic Hard Severe on Binean Shaus, and to camp on the beautiful sandy beach at the head of the loch. Our kids are now capable of walking in to wild camping spots, so we returned with our tents at the start of May. We renewed our vow to climb Ardverikie wall, but the summer somehow slipped past without this promise being fulfilled. 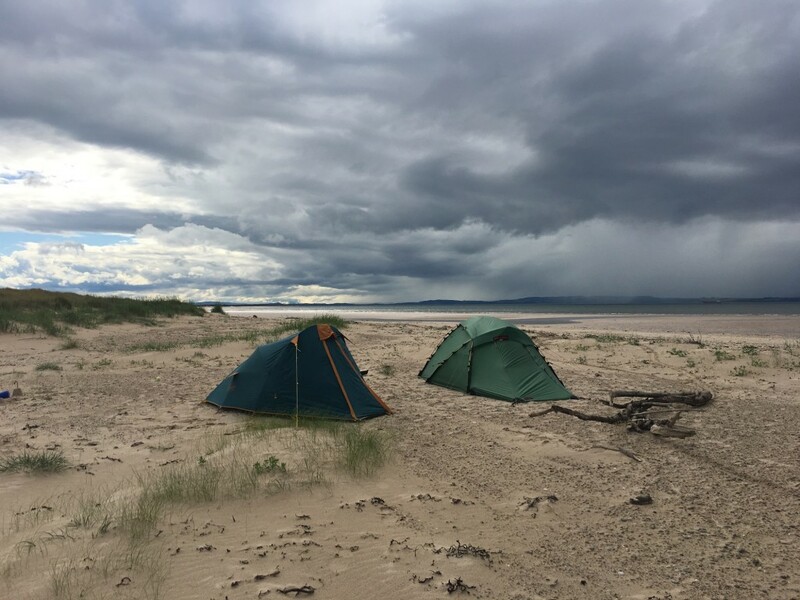 Another one I’ve wanted to do for a while, a camp on the sands near Culbin Forest. It’s a long walk through the forest to reach the beach, so I used a bicycle luggage trailer to transport our gear to the edge of the forest, bringing our camping spot within easy reach of tiny legs. Camping on a mountaintop in midsummer is one of the great joys of life. 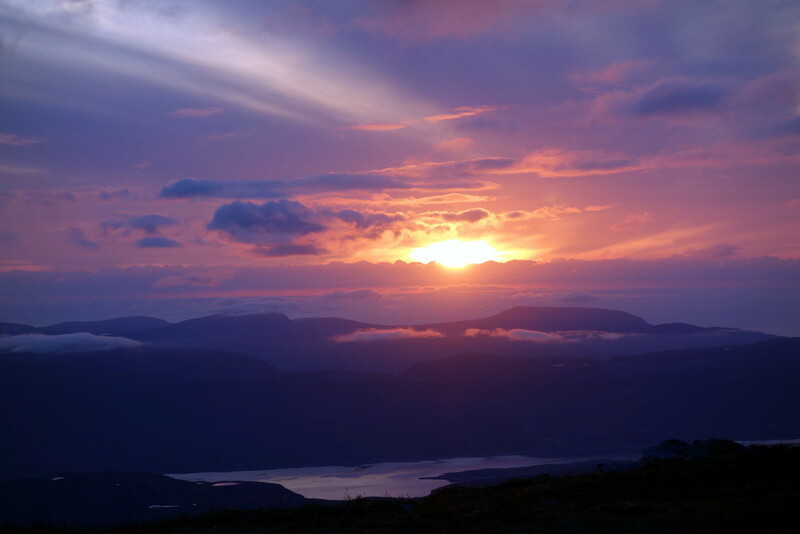 I headed north, planning to bag the two northerly Munros, Ben Hope and Ben Klibreck. It was midweek and the hills were quiet, so I was surprised to meet a fellow electrochemist on the summit of Ben Klibreck. He was from the generation before me and had learned his craft from the same master as my own PhD supervisor. Throughout the descent I kept one eye on Ben Hope, which remained swaddled in cloud. I ate a dinner of dehydrated spag bol by a small loch, thinking of how I had come down in the world from my campervan-owning days, now I’m reduced to travelling in a tiny car, taking my chances with rain and midge at mealtimes. As I drove down the glen to Ben Hope the showers cleared, and a sunny evening developed. I left the midgey glen and climbed steadily to one of the finest summits in the country, where I was rewarded with a flat mossy pitch and a beautiful sunset. The best aspect of having escaped contractual obligations is the ability to go on holiday for as long as you please. Towards the end of July we went on a family road trip, by ferry to Holland, then through Luxembourg to France, where we went as far south as the Jura before cutting west to the Massif Central, then north again, stopping in the Loire and Normandy before crossing the channel. 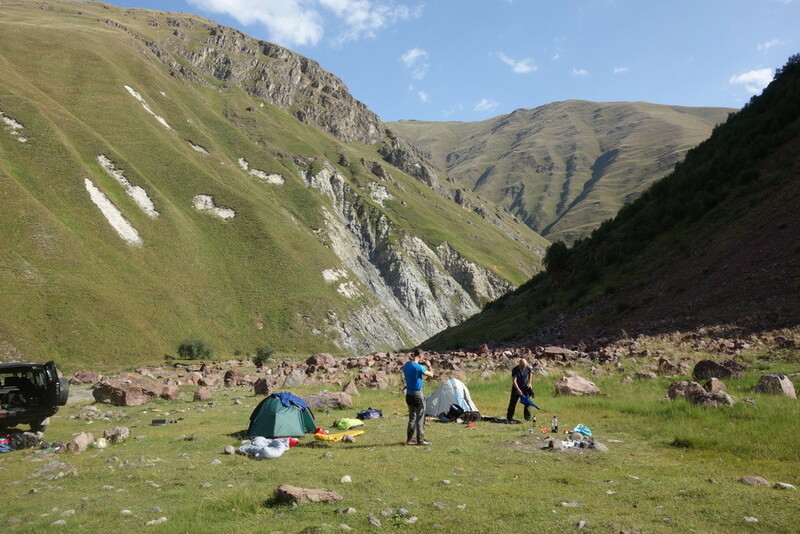 Overall we notched up 21 nights under canvas, but the highlight came later in the month, on my mountaineering trip to Ge0rgia. Most of the trip was spent making an attempt on a 5,000 m peak, Mt Kazbek. Our last two days were spent exploring the lower ranges, where 3,000 – 4,000 m peaks rise from valleys at around 2000 m. The scenery is as good as Scotland, the weather and insect situation much better. The ski touring must be amazing in winter. The Truso Valley extends west from the Georgian Military Highway, and is famous for its geothermal features, geysers, soda lakes and expanses of flowstone. The area has suffered in the conflicts between Georgia and Russia, and is mostly abandoned apart from the camps of herders and the border police, who ensure that visitors don’t get close to the border with Russian-occuppied South Ossetia. We drove up to find an nice camping spot, had a fire and drank beers and sweet Georgian wine. 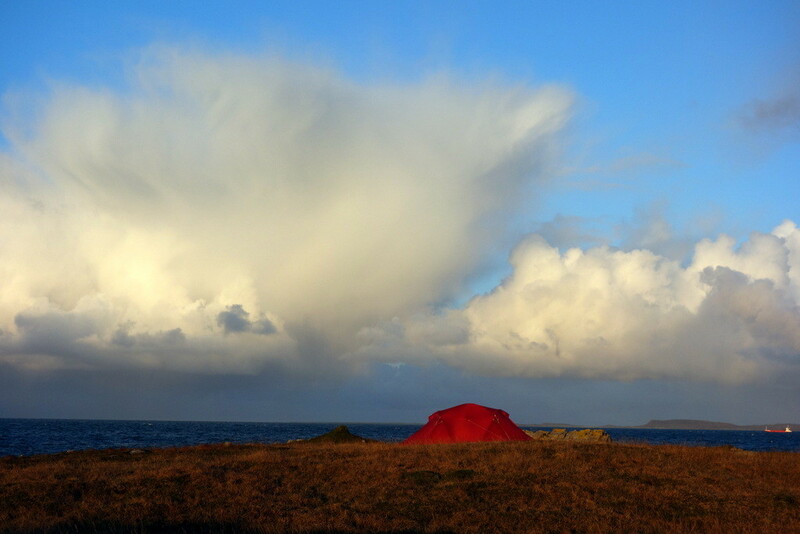 A multi-family camp at a secret west coast location. Actually it’s not secret, in fact it’s part of a campsite, but after discovering it last year it has become my favourite. If I disclose the location there’s a chance that you might be occupying it next time I want to go myself! With six families and a child count into double figures it was a great weekend, one that justified cracking into a Scandinavian Candle that I’d been saving for a special occassion. October almost slipped past without an outdoor sleep, but when my plans for a night out on the last saturday of the month fell apart, I grabbed the opportunity and enlisted my daughter for a bivvy in the local woods. It was drizzly at first, and we almost abandoned. I was glad we persisted because the skies cleared, and after the moon set the night sky was spectacular, with several huge shooting stars. It was also very interesting to sleep out so near to my house, hearing all the night noises that are normally blocked by my roof and walls, such as circling geese, honking in the dark. I forgot to take a camera with me so there is no evidence, though I do have a witness. 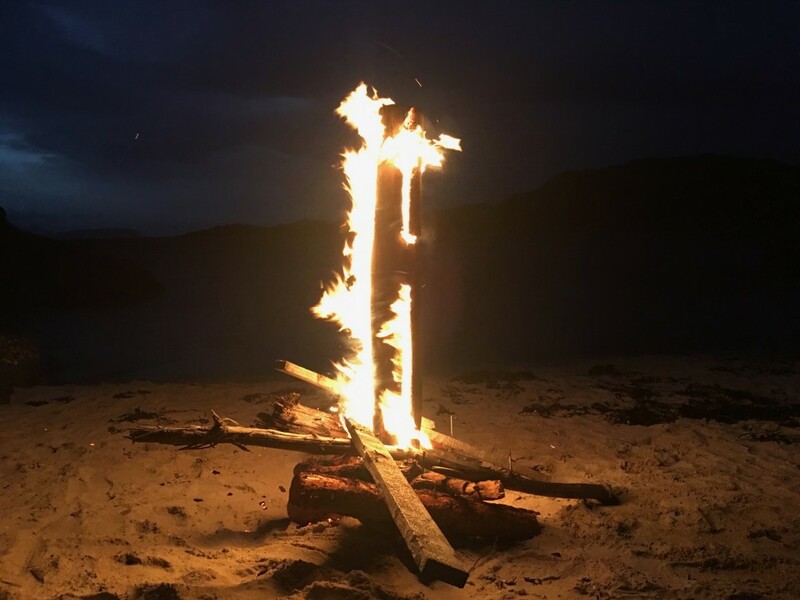 Ruantallain first came to my attention back in 2011, when I camped on the other side of Loch Tarbert at Glenbatrick. It has become my new favourite bothy. Its situation on the inaccessible west coast of Jura is impeccable, with views south to the Paps of Jura and west to Colonsay. It is surrounded by amazing scenery, with caves, arches and the vast raised beaches for which the coast is famous. There is also such a tremendous quantity of game – feisty furry seal pups, shaggy goats butting heads, and the red deer for which the island is most famous – that it was all but impossible to avoid fantasising about living off the land. I usually operate a policy of not mentioning non-MBA bothies on the internet, lest they become inundated. However, Runatallain features in one of those despicable bothy guidebooks, so the horse has well and truly bolted in this case. With only one small room open to the public it wouldn’t take much for this gem to be over-run, but thanks to its location there is little chance of this happening in practise. One more thing before you go….. If you’ve made it this far please sign up for my newsletter to make sure you never miss an update, I’ve installed a handy form below, just enter your email and away you go! Hi Gavin – saw you had an article in TGO magazine – congratulations! Cheers Craig! Nice to see it in print!